Diego Dominguez has been sacked after recording four wins, three defeats and a draw in their opening eight Top 14 games. 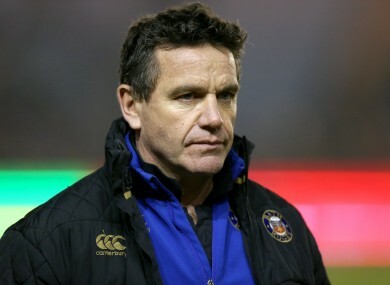 FORMER IRELAND DEFENCE coach Mike Ford has been named as Toulon’s new boss following the club’s decision to sack Diego Dominguez. Ford joined the French giants as backs coach at the end of last month to work under Dominguez but the former Italy fly-half has since been dismissed after a disappointing, by Toulon’s high standards, start to the season. Their early-season form in Europe has also been mixed; they are currently second in Pool 3 after beginning their campaign with a 31-23 home defeat to reigning champions Saracens before scoring a 15-5 away win at Sale on Friday night. Despite that victory, Toulon owner Mourad Boudjellal announced today that Ford, the father of England fly-half George, will replace Dominguez as head coach. Ford worked as Ireland’s defence coach from January 2002 to November 2005, which included the Triple Crown success in 2004, before moving to Saracens to take up a similar role. He later went on to become defence coach of England’s national team, a spell which saw Brian Ashton’s side reach the World Cup final in 2007. Ford, 50, was sacked from his head coach role at Bath in May after they finished ninth of the 12 teams in the English Premiership last season. Dominguez was only appointed in the summer to succeed Bernard Laporte, who guided Toulon to three European Cups and a French title in a remarkable five-year spell. Email “Former Ireland defence coach Ford handed top job at French giants Toulon”. Feedback on “Former Ireland defence coach Ford handed top job at French giants Toulon”.